You can add a leader to a class from either the Leaders page or the Classes page. Click Leaders to display the Leaders page. Click Classes or to display the Classes page. Select the class for which you want to add the leader. The software updates and shows the name of the selected class at the top of the right panel. 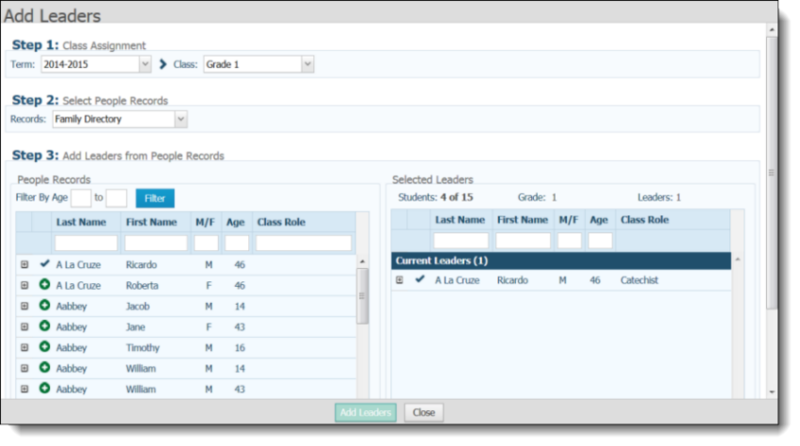 If you are on the Leaders page, a list of leaders currently assigned to the class is displayed in the grid on the right. Click +Add Leaders. If you are on the Classes page, select the Leaders tab in the bottom right panel to display the list of leaders currently assigned to the class. Click +Add Leaders. In Step 1: Class Assignment, select the term and class, respectively, from the Term and Class lists. 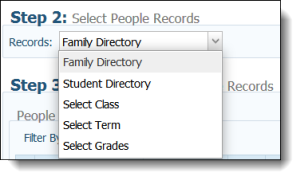 In Step 2: Select People Records, select the people records you want to search to find the individual you want to add. 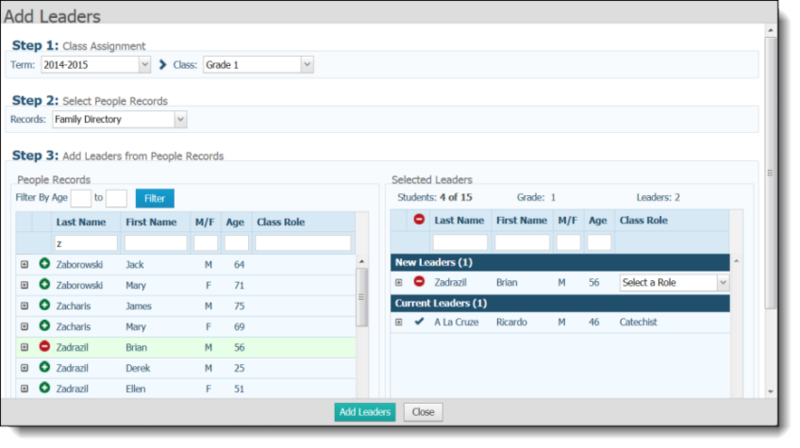 In Step 3: Add Leaders from People Records, use a filter or a combination of filters to locate the name of the person you want to add as a leader. You can filter by age, name, gender, and role. The list updates to match your filter criteria. Next to the name of the person you want to add as a leader, click . 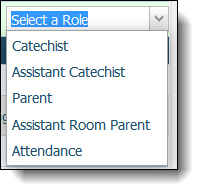 To the right of the added leader's name, specify the leader's role by selecting a role from the Select a Roles list. If you want to add another leader, repeat Steps 5d-1 and 5d-2. If you are finished adding leaders, go to Step 5d-4. The selected individuals now appear in the Leaders list for the selected class.